Coyotes and wolves are quite different animals. Gray wolves are apex predators, from which few animals in their ranges are safe. Coyotes are smaller canids that historically have preyed upon small game. In some cases, wolves even prey upon coyotes. Despite these overt physical differences, the two species are very closely related. The numerous similarities include their diets, hunting styles and high intelligence. Four types of wolflike canid inhabit North America: gray wolves (Canis lupus), red wolves (C. rufus), coyotes (C. latrans) and domestic dogs (Canis familiaris). Numerous examples of hybridization exist between all four species. Gray wolves are related incredibly closely to domestic dogs. The difference between their mitochondrial DNA is about 0.2 percent, and most mammalogists agree that dogs are the direct descendants of one or more populations of gray wolves. Gray wolves and coyotes shared a common ancestor about 2 million years ago, and their mitochondrial DNA differs by about 4 percent. The origin and status of the endangered red wolf is debated. Some scientists suggest that the entire species is the product of hybidization between gray wolves and coyotes. Others hypothesize that although interbreeding between red wolves and coyotes is extensive, red wolves form an independent lineage. All canids are intelligent animals who can solve problems and outwit prey. Coyotes' intelligence is evident in their ability to figure out how to survive in close proximity to humans. Additionally, both species exhibit their intelligence through their development of complex social systems. 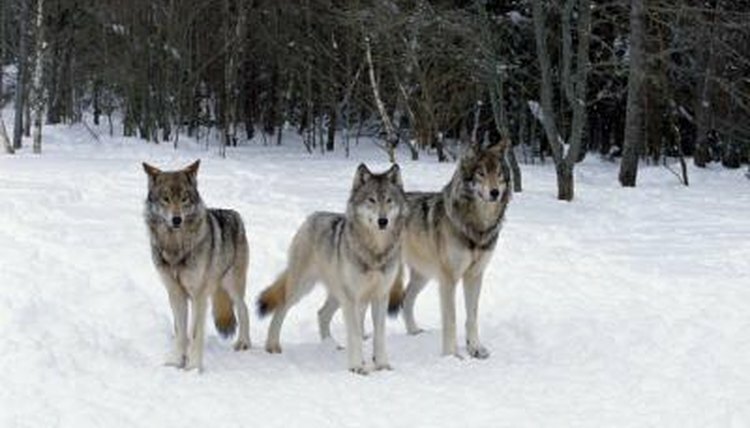 Wolves are very social animals who form packs with clear hierarchies; in most cases, only the alpha male and female mate and reproduce. Coyotes are more flexible, and although some of them remain lifelong loners, others do form packs. Pack hunting greatly increases the chances for a successful hunt, and it can be used on both large and small prey. Both wolves and coyotes are primarily carnivorous hunters, though they also scavenge carcasses. Coyotes frequently scavenge for berries and fruit. Although wolves will take these items from time to time, they are almost exclusively carnivorous. In general, wolves take much larger prey -- primarily ungulates -- and coyotes hunt smaller animals such as rabbits, birds and rodents. Some coyote populations -- especially in the U.S. Northeast and in eastern Canada -- are exceeding their historic size. In these areas, which lack gray wolves, coyotes are hunting deer and other large prey with increasing frequency. Most canids rely on exhausting their prey while relentlessly trailing it until it tires, rather than by using speed outright. Their endurance is also exhibited in both species' tendency to maintain large ranges, and to disperse over long distances. Gray wolves sometimes travel more than 600 miles from their birthplaces over the course of their lives. Ranchers, farmers and pioneers frequently consider both coyotes and wolves as pests. Humans have extirpated wolves from much of their historic range, but coyotes have increased their range over time. Formerly restricted to the U.S. West, coyotes are now found in virtually every U.S. state. In 1985, New Yorkers observed a pair of coyotes living in Central Park. How Have Humans Affected the Evolutionary Changes in Wolves? What Are the Predators of the Spotted Hyena?